The Ministry of Education and Training has requested the Hanoi Department of Education and Training to investigate an incident in which a local primary pupil was slapped by his classmate under the teacher’s instruction. Local newspapers reported that the case occurred at Class 2A5 of Quang Trung Primary School in Dong Da District on Tuesday. Teacher Nguyen Ha Trang ordered a pupil to slap another classmate 50 times as he made noises and used foul language in the class. When coming back home on the day, the boy told his mother that he did not want to go to school, saying that the teacher asked his classmate to slab him. The boy added that when his friend slapped for 20 times, he cried so the teacher told him to stop. The boy’s mother Ngo Thanh Tam said that her family asked some of her son’s classmates to verify the information and they said it was true. 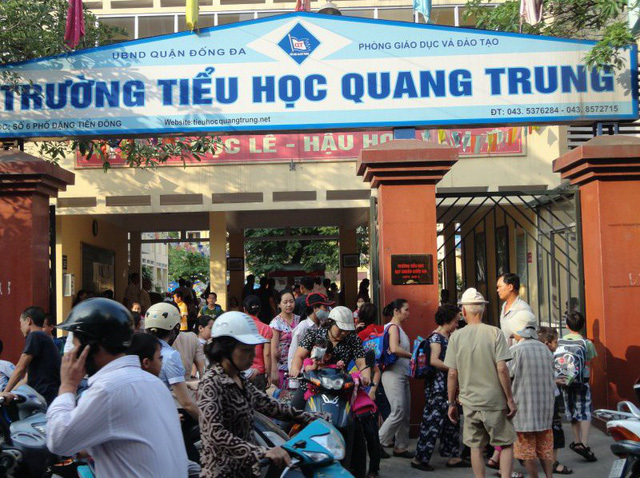 However, at the press conference held on December 6 at Quang Trung Primary School, headmaster of the school Le Anh Van denied the accusation on Trang, specifying that the two pupils had a fight and then slapped each other. Trang only ordered them to stop. Van noted that when being asked about what happened, some pupils in Class 2A5 did not remember the case, while many said that they saw the two classmates slap each other, but just several times, not 50 times as reported. Meanwhile, teacher Nguyen Ha Trang has been suspended following the accusation. A teacher at a secondary school in the central province of Quang Binh recently instructed 23 pupils to slap a classmate 231 times for using foul language. Minister of Education and Training Phung Xuan Nha admitted that violence has tended to be on the rise at schools, which is a challenge for the education sector. In May this year, the Ministry of Education and Training issued a directive on improving teachers, including the construction of a programme on a code of conduct for teachers between 2018 and 2025. “Following the incident in Quang Binh, the ministry will intensify the fight against school violence by sending instructions to all schools nationwide. The ministry will also conduct surveys to find the real causes of school violence to take appropriate measures,” Nha highlighted.